Raja Rajisvaram, popularly known as the Big Temple of Thanjavur has attracted many scholars to work on its art and architecture in detail. When I went through all the available literature and the research works about the temple, I was rudely shocked to understand that there was not a single good book in Tamil which contains all the salient features of this temple. Hence I decided to take up this temple for research study. Dr. M. Rajamanikkanar Centre for Historical Research had recently started a Diploma Course in temple arts. There are twelve students who belong to various walks of life. I divided the entire temple complex into 12 regions and each student was asked to take up one region of their choice. The duration of the study was forty days. They went for field study only on Sundays; so altogether only six Sundays. They were advised to have a careful scrutiny of the temple before they could read any of the available research material on the region of their choice. Since they were already well-versed on temple architecture, iconography, and epigraphy, it was not very difficult for them to analyze the intricate details of the temple. When they went through the research works and literature on the temple they could easily find out the mistakes committed by the scholars and the errors in the identification of certain facts. Myself and Miss. M. Nalini, our epigraphist, who ahs been my student since her M.A. onwards, helped them whenever they had difficulties in their research work. I do not want to mention the names but I should quote a few incidences which were eye-openers for our students. I invited a few scholars who had already worked on this temple to guide our students in their field work. When questions were raised regarding doubtful areas, the scholars were unable to explain even though they had worked on it. At the end, our students could realize how much the scholars have missed just because they failed to undertake a meticulous and dedicated field study. Our research has yielded many new findings. 1. The topmost tala of the vimana of RajaRajesvaram is not made up of a single stone as believed and told by a number of scholars. 2. 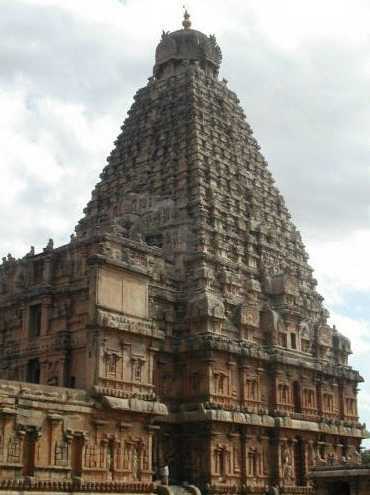 The sikhara of the same vimana is also not made up of a single stone as told by manyu scholars. 3. The shadow of the sikhara as well as the stupa fall very much within the campus in the early evenings. 5. the Buddha panel seen on the eastern face of the southern entrance of the ardha mandapa is a part of the Triparantaka story and does not depict the great Buddha. 6. The theme of “Thiru kailaya Ghana Ula”, a popular literature sung by Seraman Perumal is depicted in panels in two places of this temple thereby proving that people were aware of this literature during the tenth century A.D.
7. The icon which is wrongly identified by a few scholars as Lingodhbhavar is nothing but a rare depiction of Vishnu Anugraha Murthi. 8. The names of the sculptors mentioned as the builder of this temple by a few scholars are none other than the regular temple servant. 9. the stories of Saivite nayanmars were very popular among the people during the tenth century. Probably Sekkizhar visited this temple and after studying the sculptures, the bronze icons, and the paintings he wrote Peria Puranam Historical details of the lives of Kannappar, Chandesa Sundarar, Siruthondar, Meipporul Nayanar and a few others are gleaned from sculptures, bronzes, paintings, and inscriptions. The paintings which had been analyzed and critically studied by the doyens of the field, still have a lot to reveal. One great scholar in his book on paintings says that some of these Chola paintings are post-Rajaraja. He particularly points out the painting which depicts the life of Sundarar and says that it was painted after the period of Peria Puranam. It si a miserable statement. If only this scholar had spent some time in reading the verses of Sundarar’s life in Peria Puranam probably he would not have made such a statement. The paintings had been done after a careful study of the pathigams of Sundarar and not Peria Puranam. Some intricate details seen in this panel have been totally missed by all the scholars who have written either articles or books on this subject. Let me not go into all the details but give one or two salient points. The holy pilgrimage to Kailas in the climax of Sundarar’s life. In that panel he is seen over the elephant called Iravatham. Cheraman seated over the horse is seen in front of him. Both of them are proceeding to Kailas. If we carefully see, we can visualize that the legs of both the animals are kept in the sea. They are actually in the stage of take off from the seashore. Sundarar was taken to Kaiilas when he was praying in Tiruvanjaikalam, a coastal town of the Chera country. Sekkizhar has not said anything about the take off but mentions only about thte travel. Most of the scholars who had dealt on this subject have skipped this point. Dr. Rajamanikkar is the only scholar who had at least attempted to explain the reason for the presence of sea with the help of Silappathikaram. Of course, his explanation also is not satisfactory. It is the திருநொடித்தான் மலை திருப்பதிகம் of Sundarar which gives the key to the puzzle. Sundarar very clearly says that Lord Varuna, the god of water came and gave him a send off in the form of sea. அலைகடலால் அரையன் அலர்கொண்டு முன் வந்து இறைஞ்ச"
there is one more interesting point in this panel, which again has been missed by all the scholars. A man is seen traveling along with Sundarar by clinging himself to the tail of the elephant. All our attempts to identify this individual were in vain. Just before our seminar, I once again areferred to Sundarar’s திருநொடித்தான் மலை திருப்பதிகம். To my surprise I found the solution in it. According to Sundarar, a certain Vaanan (வாணன்) came to receive and guide him to Kailas.